Event 54 bracelet winner Maxim Lykov and supporters. Max Lykov came into today's final table as the chip leader with almost a third of the chips in play and never lost that lead as he stayed in command throughout the day's proceedings. The action was fast early on as Stanislav Alehkin hit an early double up with through Joshua Evans' to give the Russian a fighting chance. It was Sebastien Roy though, who would bust first when he reraised all in with against Lykov, the latter's rivering broadway to send the French-Canadian spinning out of the event. Joshua Evans, crippled from doubling up Alekhin earlier was when he pushed with and found Dror Michaelo more than willing to make the call with . Michaelo had a real sweat though, when the board came , fading the flush draw. With Lykov and Michaelo holding most of the chips, everyone else was suffering as short stacks. Douglas MacKinnon made a push with queen-seven but Lykov held pocket sevens to dominate him, a queenless board later and the chip leader was increasing said lead. Ren Ho Zhang won a huge flip against Alekhin and then dispatched the crippled short stack in sixth place, leaving just one Russian remaining in Lykov. At this point, Englishman Warren Wooldridge came into his own, first doubling through Lykov then knocking out Harald Olsen in fifth place. Olsen had pushed with from the small blind and Wooldridge made the call with , neither player hit and Wooldridge moved up into second place as a result. Ren Ho Zhang was knocked out in Lykov in third when he bluffed all in with a missed straight draw, only to find Lykov happy to call with a rivered flush. Wooldridge was then eliminated in 3rd place after an extended period of three-handed play, Wooldridge got it in with against Lykov's but the latter flopped a nine and it managed to hold to give a 2:1 lead over Michaelo going into heads up. The final battle against Michaelo was brief and bloody, the Russian getting paid off when he flopped the nut straight and then quickly dispatching his foe when he had him all in with a dominating hand. Lykov takes home nearly $650,000 for his efforts and already having an EPT title, is now two-thirds of the way towards a triple crown. 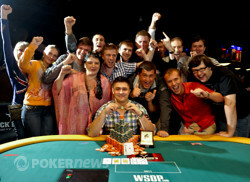 It also makes him the third Russian to capture a bracelet this summer, an impressive achievement. 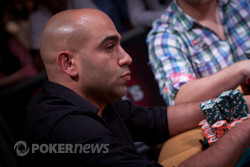 Congratulations to him from everyone at PokerNews and don't forget, the Main Event will be starting tomorrow from 12pm! Dror Michaelo raised to 250,000 on the button and Maxim Lykov slid out a large stack of green T25,000 chips totaling around 700,000. Michaelo then announced he was all in and Lykov snap-called. Michaelo was behind and would need some help to stay alive. The flop came making Lykov's hand even stronger and leaving Michaelo drawing very slim. The on the turn sealed Michaelo's fate and after the came on the river Michaelo and Lykov shared a friendly handshake before Lykov flew over to the rail to hug his friends who were already cheering in excitement. Michaelo will take home an impressive $401,296 for his performance. Max Lykov raised to 260,000 and Dror Michaelo made the call to see a flop. Michaelo led out for 325,000 and Lykov made the call to see the turn. Michaelo fired 325,000 again and Lykov made it 850,000 to play. Michaelo made the call and then fired out 800,000 on the river. Lykov seemed a little concerned, asking Michaelo how much he had back before electing to just call. Michaelo flipped but Lykov showed for the flopped straight to take an even bigger lead in this event. 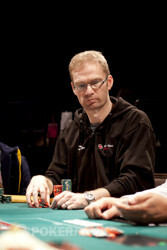 Warren Wooldridge raised to 300,000 on the button and Maxim Lykov announced he was all in from the big blind. Wooldridge called putting himself at risk. Wooldridge was in the lead and poised to double until the flop came giving Lykov a pair of nines. Wooldridge would need to pair his jack or hit an eight to make a straight to stay alive but the turn and river brought the and and Wooldridge was eliminated. Max Lykov raised to 250,000 on the button and Dror Michaelo re-raised to 620,000. Lykov wasted little time in declaring he was all in and Michaelo snap called putting himself at risk. Michaelo was ahead and when the flop came his hand was nearly unbeatable. The turn brought the leaving Lykov drawing dead and the river was a meaningless . Michaelo doubled his stack and took a decent chunk of chips from Lykov in the process. Max Lykov has moved the aggression up another notch. He's raising almost every pot and winning the vast majority while the other two players are yet to find a way to combat it. The only major pot that went away from him was when he raised to 260,000 in the small blind against Warren Wooldridge but then check-folded to a 500,000 bet on the flop. Backed by a strong Russian rail however, it's hard not to back him at this point.